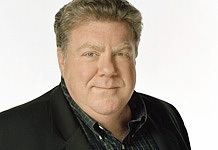 George Wendt was born and raised in Chicago, Illinois, USA. He attended a strict Jesuit prep school and then dropped out of Notre Dame University after a few uneventful years. He worked with the Windy City’s famed Second City comedy troupe from 1974-1980. He is best known for playing Norm Peterson on the hit televison series, “Cheers” (1982). He is married to actress Bernadette Birkett, who provided the rare offscreen voice of Vera, Norm’s unseen wife, Vera. The couple have two sons and a daughter. They met while working at the Second City in Chicago. Do you want to hire George Wendt? Directly request a quote. In 48 hours we can send you the availability of George Wendt If you would like to book George Wendt, Entertainment Booking Agency is the right place. We will offer you the best price and contact the management or we directly contact George Wendt. For corporate appearances or speaking engagements you can contact our agents and the will help you true the process. Tags: hire George Wendt, George Wendt booking, book George Wendt, George Wendt appearances, find more information on booking George Wendt for appearances, George Wendt speaking engagements, George Wendt endorsements/spokesperson, George Wendt appearance fees, George Wendt booking agency contact info, biography of George Wendt, Contact an artist booking talent agent find a speakers bureau that can book George Wendt, speaker booking agency for George Wendt, George Wendt booking agency, George Wendt booking for corporate event. EBA is one of the biggest entertainment booking agencies in the World. We book hundreds of celebrities, artist, athletes and speakers in a year. Important to know is that we are not claiming to be the management of George Wendt. We are not the official agent for George Wendt. Companies from around the globe book these artists and speakers true our company be course we have one of the biggest networks and we always have direct contact with the artist or the management. We help you to find the right celebrities for your corporate of private events. Please contact one of our agents to get free advice and we will help to get the world-famous artist on your party.